Make sure that your startup video stands out and doesn't sound like anyone else's, with original tracks from Jukedeck. 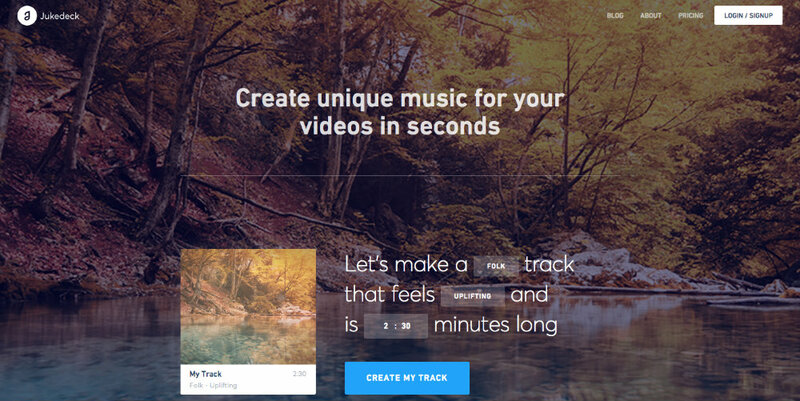 Jukedeck lets you create unique music for your online video. I have watched more startup explainer videos in my life than anyone should ever be subjected to. I mean, it’s a hazard of the job, right? When you write about startups, you inevitably end up watching startup explainer videos. As a result, I’ve seen the full gamut — the good, the bad, the hilarious, and the trying really hard to be hilarious but totally failing. I’ve also seen so many trends come and go. And, of course, I’ve witnessed the ones that just won’t die. One of those trends with nine lives is, unfortunately, what I call “tinkly” music. (I’m sure it has an official name, but this is my column so I’m allowed to make up my own terms.) You’ve heard it. It’s usually accompanied by a cartoon character who pops up while an overly-chipper narrator says “This is Tom. Tom has a problem.” and then goes on to explain how this new app is going to solve Tom’s problem. But I get why people use it. It’s easy and it’s not copyrighted, which is a problem that more and more people are running into when they go to create online videos these days. But how do you make music for your video if you’re not a composer? Sounds impossible, right? Jukedeck is free for up to five downloads per month, after which they charge $21.99 per download or $199 per track. Totally affordable, so please, please, please: do this startup writer a favor. Make your music on Jukedeck and commit to no more tinkly music.